Wales' only previous win over England came in 2009. 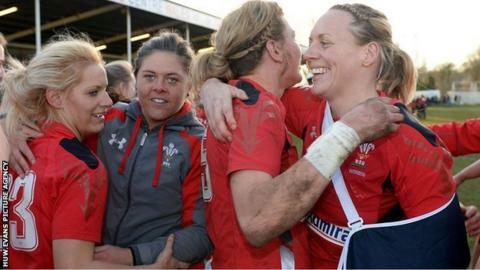 Wales women's rugby captain Rachel Taylor says her team must not be a "one-hit wonder" after their shock 13-0 Six Nations win over England. The lock led Wales to only their second win over the world champions, who were without 14 players from the team that won the World Cup. "We knew they were there for the taking because of the changes since they won the World Cup," said Taylor. "But unlike in previous years, we were able to do something about it." Wales now face Scotland in Cumbernauld on 14 February, with Taylor calling on her team to recreate the form that saw off England in Swansea on Sunday. "The important thing is this victory mustn't be a one-hit wonder," she added. "We have to recover well this week and prepare for what is going to be another massive challenge against Scotland at the weekend." The Scots will be looking to bounce back from a 42-0 thrashing by France in their opening game. While that result may have dented Scottish morale, Wales try scorer Laurie Harries says spirits are soaring among the Wales players. "The buzz within the Welsh camp for the past few weeks has been amazing and I don't think we have ever felt like this before," Harries said. "We had the belief that we could go out and beat the world champions and that's exactly what we did - it's the best feeling I have ever had." Laurie Harries' try clinched Wales' historic Six Nations win over England.